Mona jumped her home’s fence. 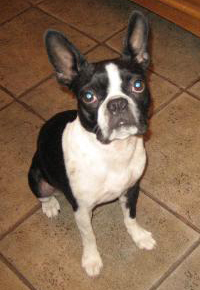 On June 13th, Mona, our Boston Terrier was let out in the backyard and about twenty minutes later we realized that she had jumped the fence. We walked and drove around our neighborhood but we could not locate her. Garland Animal Services, Pet Harbor and HomeAgain were notified. Days passed and we were coming to the realization that we would never see her again. On June 20th we received a surprised phone call from Rosemeade Veterinary Clinic stating that Mona was dropped off at their location in Carrolton. Mona was missing in Garland and was roaming the streets in Carrolton. We are so happy to have her back home. Mona was reunited with us because she has a microchip implanted. Our dog is an inside dog, but anything can happen. A microchip is a permanent way to track the owners down if they lose their tags. If she did not have a microchip there is no way she would have been reunited back with us.